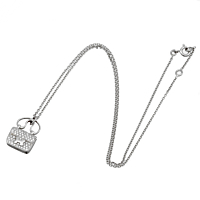 The stunning Hermes Constance charm pendant necklace resembles the classic Hermes handbag. Crafted in 18k white gold, the Contance Charm is delicately adorned with 65 Hermes round brilliant cut diamonds (.29ct). A subtle, solid white gold H adorns the pendant. The soft edged bail, resembling a bridle bit, allows the pendant to move gracefully on the white gold chain. Necklace Length 15" or 15.7"